Baby elephant being washed? Yes, adorable, but that’s about it. That’s probably the highest compliment I can give to Tim Burton’s Dumbo, a live-action remake of the 1941 animated film of the same name about a circus elephant with large floppy ears who learns to fly. Burton’s film expands on that story in numerous ways, while failing at building its own world. It’s so full of unmotivated actions and unexplained connections, I can only assume it’s being emotionally dependent on the audience’s nostalgia for the original film. So much is implied or off-screen, waiting to be filled in by the viewer. What’s left is a cold, bloated interpretation of the story that’s more likely to have you scratching your head with confusion than blowing your nose from crying. Dumbo centers on the antics of a traveling circus lead by Max Medici (Danny DeVito) and the return of one of the circus’ stars, Holt Farrier (Colin Farrell), who has just come back from war. Holt’s two kids Milly and Joe (Nico Parker and Finley Hobbins) are happy to see him because their mother, his wife, died while Holt was away. Which should be sad, but isn’t because the characters know that before the audience does, so the matter-of-fact delivery about her death is basically an afterthought. As is the fact Holt lost his arm and may just be a war hero. These things are briefly mentioned or joked about, but never explored. That disconnect continues as Medici reveals he’s purchased a pregnant elephant named Mrs. Jumbo and plans to restore the circus to its former glory once she has her baby. That baby comes rather quickly and is revealed only through a confusing scene with Mrs. Jumbo being forced out of her cage, leaving behind a large pile of straw that’ll eventually be revealed as baby Dumbo. The family loves Dumbo. Or at least that’s what the film says. 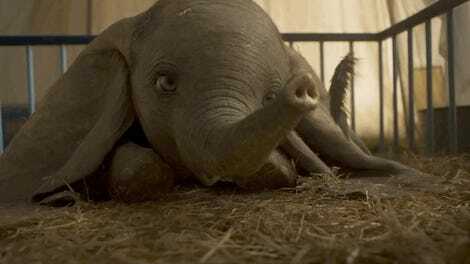 Once Dumbo is in the movie, the whole plot is predicated on him being treated as a mistake. Like his large, floppy ears are a bad thing. And yet, clearly this baby elephant with huge ears is adorable and the characters being so negative about his nature feels dated. Isn’t being different in a circus not just good, but encouraged? And yet, there’s this instant aversion and venom from them. It makes no sense and feels like it’s only happening because that’s what the original film dictated—which, hopefully, you have begun to realize is a running theme. Eventually, those ears become an asset not a liability and we see Dumbo fly. Which, when it happens, is incredibly charming. Burton intercuts the CGI elephant with the wowed reactions of the crowd and rousing Danny Elfman score, and in those moments, Dumbo works. And it happens several times throughout the film, which is nice. Each time though, it’s fleeting, especially when the film takes a hairpin turn into its second act. After Dumbo’s first flight, we meet mega circus superstar V. A. Vandevere (Michael Keaton), who wants to bring Dumbo to his own New York theme park called Dreamland, which bears a striking resemblance to a Disney park. Keaton plays Vandevere as an over-the-top huckster, who is fun to watch but also clearly villainous. 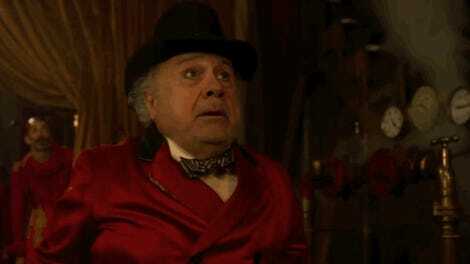 So, when Medici almost instantly falls for his ruse, it’s disappointing and odd. Before that moment, DeVito plays his character in a goofy, but earnest way, giving one of the best performances in the film. The Medici of act one would definitely be wary around Vandevere and yet, if he was, the movie couldn’t proceed, so he chooses just to proceed anyway. Another example of things not quite fitting correctly. At this point, Burton hopes he’s got you emotionally locked in to these characters, though he doesn’t, and the film becomes a runaway train of plot. Suffice to say things get weird and awkward, in large part to the frustratingly impulsive actions of Keaton’s character. So much of what happens in the final two-thirds of Dumbo could have been solved by Vandevere just making a rational decision. Hell, even a clearly evil decision. But he doesn’t make evil decisions, they’re just bad ones. Like when one of his employees tells Vandevere not to touch any switches or he could do irreversible damage. So what does he do? Not only does he touch something, he touches everything, and many of those touches are actually smashes. Of course, things go horribly wrong. It’s Michael Keaton, which is nice at least. Meanwhile, all this forward momentum begins to push characters we may have been interested in to the side. Medici becomes an afterthought. The kids, who are likable but largely unremarkable, find themselves mostly relegated to the sidelines. The film even seems to give Holt a possible romantic interest (in the form of a trapeze artist played by Eva Green), but in execution, there’s nothing actually romantic happening between them. The whole thing feels out of place, especially because Green’s character actually has an arc, unlike almost everyone else in the film. Overall, it’s a mostly mixed bag for such a top-notch cast. That’s the story of Dumbo, though. Unmotivated actions coupled with a razor-thin veil of emotion, coupled with a decent CG spectacle into a film that never truly takes flight. Not even the cast—which also includes Oscar winner Alan Arkin, who gives a shockingly mundane performance—can save the film from itself. Kids will probably enjoy Burton’s brand of wonder and forgive the film’s serious issues, and adults might find their emotional attachment to the 1941 original lifting their spirits. Without those boosts though, Dumbo is a no go. But, hey, at least the elephant is cute.